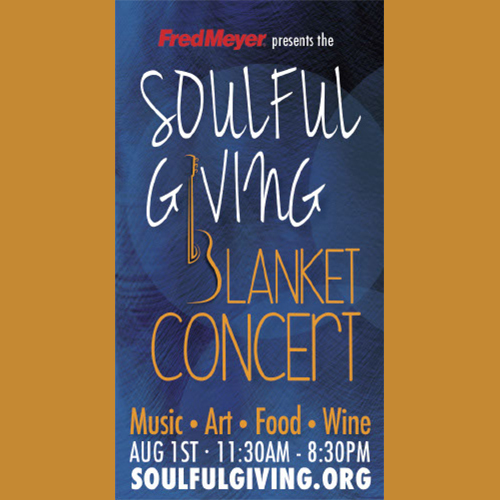 Enjoy great music and amazing food during the Soulful Giving Blanket Concert in Troutdale, Oregon. All proceeds will benefit Randall Children's Hospital at Legacy Emanuel and Providence Cancer Research Center. A Party Bus will be available from Portland to the event and back. While enjoying the Soulful Giving Blanket Concert you'll also be offered food samplings from Portland's finest restaurants, a silent auction and much more. Learn details about the Party Bus transporting people to this Soulful Giving Blanket Concert below. Leave the driving to us! This fun party bus service, also known as the Cascadia Cruiser line, will be conveniently transporting downtown and westside guests (21 & over) from a designated parking area to our event throughout the day. For the price of $1, you can enjoy the fun with traveling music and receive a complimentary glass of Widmer beer along the way! The first pick-up begins at 11:00am and the last returning shuttle from Troutdale is at 9:00pm. Simply park your vehicle for free at the following location, wait next to our SOUL BUS sign, and watch for one of our colorful party buses to arrive! This is a gorgeous place, and I won't soon forget it. Attended an event at party halls in Bay area. The reception hour was held in one of the rooms next to the hall. I loved their buttery mashed sweet potato.